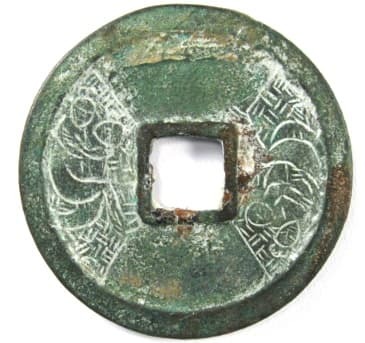 Ancient Chinese coins first started displaying "charm" and "amulet" features more than 2,000 years ago and many examples of these ban liang (半 两) and wu zhu (五 铢) coins can be seen at Emergence of Chinese Charms -- Symbols Begin to Appear on Chinese Coins. 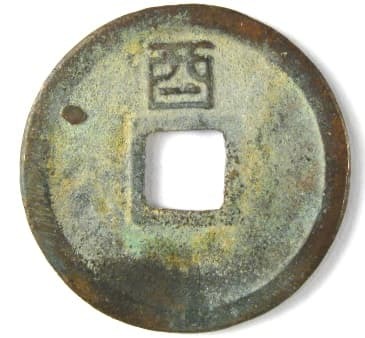 While the first "true" charms appeared during the Han Dynasty (206 BC - 220 AD), many of the coins of this period also have charm characteristics. For example, some coins have stars, moons, auspicious clouds, etc. on their reverse side. Others have stars on their obverse side. Several examples are displayed below. There were also regularly issued government coins which did not have any special charm symbols but, nevertheless, were considered to have the same powers as a true charm. Please see the Wang Mang knife money and the kang xi tong bao (康 熙通宝) coins as examples. Additionally, there are Chinese charms which closely resemble actual Chinese coins. 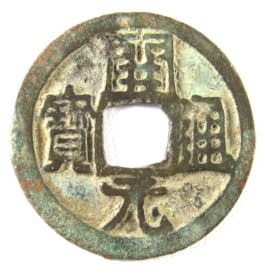 Many examples of these coin-like charms can be seen at Chinese Charms with Coin Inscriptions. For detailed discussions of the meaning of charm symbols, please visit Ancient Chinese Charm Symbols: Star, Moon, Cloud and Dragon and also Chinese Charms -- Hidden Meaning of Symbols. This is considered to be one of the most beautiful coins of ancient China. It was cast in the years 7-9 AD during the reign of Wang Mang of the short-lived Xin Dynasty (7 - 23 AD). This knife money is popularly known as jin cuo dao (金错刀) or gold inlaid knife. The top portion, which is round with a square hole, resembles the other coins of the time. The Chinese character above the hole is yi (一) meaning "one". The character below the hole is dao (刀) which is "knife." The translation is "one knife" and the characters are inlaid with real gold. 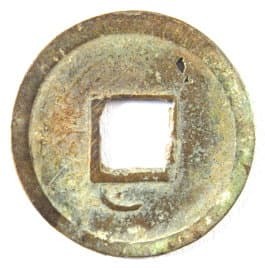 The lower blade portion of the coin has the characters ping wu qian (平五千) which translates as "worth five thousand". 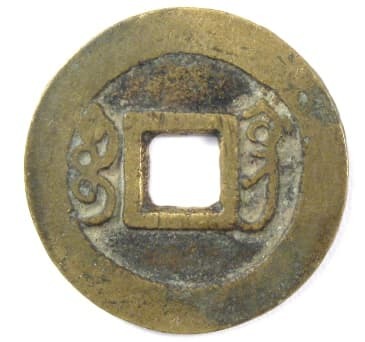 During the years of Wang Mang's reign, this coin had a token value equal to 5,000 bronze coins! Besides its monetary worth, this knife money was also desired for its value as a charm. The way the very bottom character 千 (qian meaning "thousand") is written resembles very closely the character 子 (zi) which means "son". The inscription on the coin could therefore be read as "worth five sons" which was considered very auspicious during ancient times. Male children were traditionally favored by Chinese parents for several reasons. Sons were responsible for continuing the ancestral lineage and performing ancestor worship. When they grew up, they were responsible for taking care of their parents. Parents also hoped that their sons would be successful in achieving a high government office and thereby bring honor and wealth to the family. Daughters, on the other hand, were traditionally less desired because when they grew up, they would marry, leave the home and have the responsibility of taking care of their in-laws. The ideal family during ancient times was considered to be five sons and two daughters. This knife coin was, therefore, treasured as a charm that, hopefully, would bring the family many male offspring. The coin is 73.5 mm in length. The upper ring has a diameter of 28 mm and the lower blade has a maximum diameter of 15 mm. The weight is 32.5 grams. 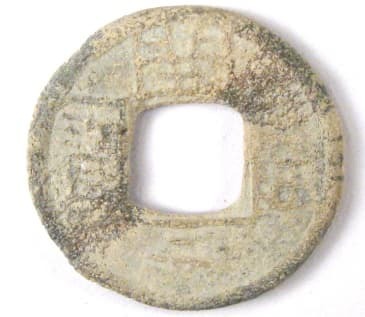 This coin was cast during the reign of Wang Mang beginning in 14 AD. 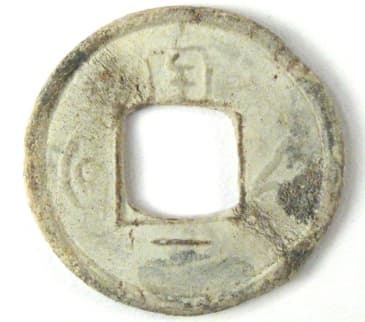 The inscription (legend) is read right to left as bu quan (布泉) which means "spade coin". The reason this coin has "charm" features is because women of that time believed that wearing this coin on their sash would mean that they would give birth to a boy. Chinese society has traditionally placed a great emphasis on having children, and males in particular, to perform Confucian filial piety responsibilities and rituals. 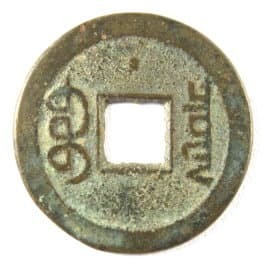 For this reason, this coin is also known as the Male Cash Coin (nan qian 男钱). Please see Confucian Charms for more on Confucianism. As can be seen, the reverse side of the coin is blank. This coin has a diameter of 24 mm and a weight of 2.4 grams. Many wu zhu or wu shu (五 铢) coins of the Eastern Han Dynasty display simple symbols such as dots (stars), crescents (moons), and circles (suns). Others display numbers, rod numerals, swastikas and other Chinese characters. 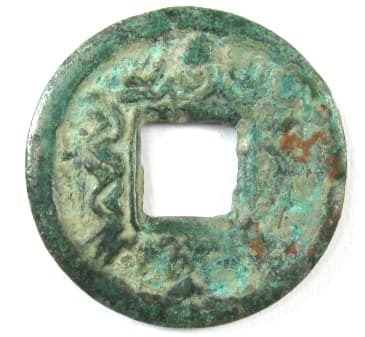 A number of these wu zhu coins with special characteristics may be seen Emergence of Chinese Charms. The wu zhu displayed at the left has a different symbol. Above the square hole is an "auspicious cloud" (xiang yun 祥云). The cloud is considered a "good luck" symbol because the Chinese word for "cloud" (yun 云) is pronounced the same as the word for "luck" or "fortune" (yun (运). This coin has another unusual feature. The upper and lower parts of the wu (五) character to the right of the hole are separated from each other. The Chinese refer to this as a "detached wu" although the significance of this feature is unknown. This coin has a diameter of 22.6 mm and a weight of 1.5 grams. The several centuries from the end of the Han (220 AD) to the unification of China under the Sui Dynasty (581 AD) was a period of recurring civil wars and social upheaval. At the beginning of this period were the Three Kingdoms consisting of the State of Wei (220-265 AD), the State of Shu (221-263 AD) and the State of Wu (222-280 AD). The State of Shu, also known as Shu Han (蜀汉), was ruled by Liu Bei (刘备). Liu Bei was forever immortalized as a hero in one of China's greatest historical novels entitled the Romance of the Three Kingdoms written in the 14th Century by Luo Guanzhong. 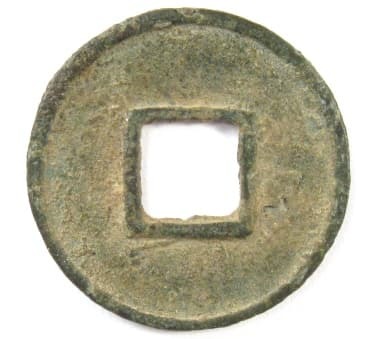 During times of war in ancient China, it was common for rulers to issue coins of large denominations. The coin at the left has the inscription zhi bai wu zhu (直百五铢) and was issued in 214 AD by Liu Bei. 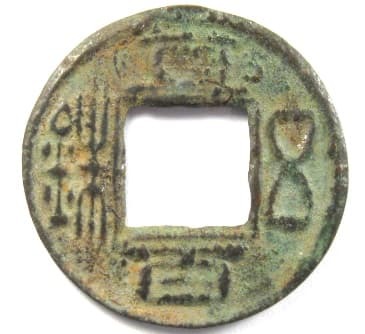 Even though the coin is approximately the same size and weight of the wu zhu (五铢) coins of the Han Dynasty, the inscription translates as "Value One Hundred Wu Zhu" coins. What is particularly fascinating about this specimen is the reverse side. To make viewing more convenient, I have rotated the coin 90 degrees clockwise. 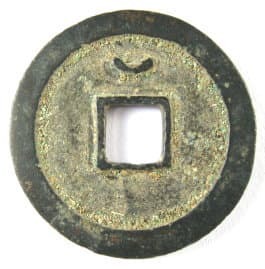 While symbols are sometimes found on ancient Chinese coins, such as those from the Qin and Han Dynasties, they are usually incused (carved) into the coin after casting. On this particular coin, the fish protrudes above the surface, which means that the fish symbol had to have been a design element of the mold itself. This coin, with the cast fish on the reverse side, may be unique. The coin has a diameter of 25.7 mm and a weight of 2.8 grams. 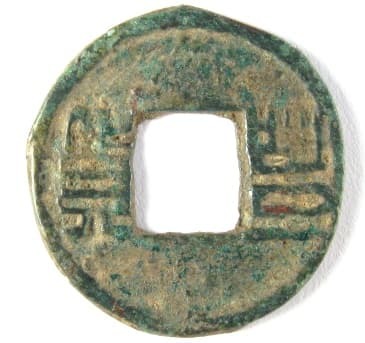 This Chinese coin was cast during the years 221-265 AD in the Kingdom of Shu. The inscription (legend) is tai ping bai qian (太平百钱) which translates as Taiping (Great Peace) One Hundred Cash. The reverse side is filled with wavy lines and dots. The wavy lines represent water waves. The dot at the very top and the one at the very bottom represent stars. 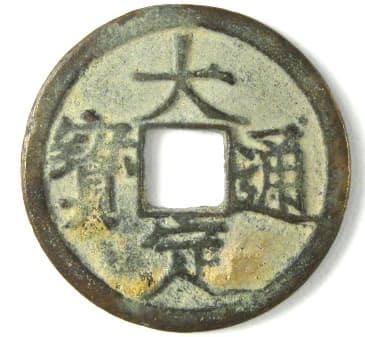 Even though this was a legal circulating coin during the period of the Three Kingdoms, it was frequently used in later dynasties as a charm because of its inscription referring to "peace" and the symbols on its reverse side. For more information concerning the symbolism please see Ancient Chinese Charm Symbols: Star, Moon, Cloud and Dragon. The diameter of the coin is 26 mm and the weight is 6.0 grams. This coin was cast in the year 319 during the reign of King She Le of the Later Zhao Kingdom (319-352) of the Eastern Jin Dynasty (317-420). The inscription, written in seal script, reads feng huo (丰货) which translates as "coin of abundance". It was believed at the time that having this coin would result in great wealth which, as a result, earned it the nickname "cash of riches". The diameter of the coin is 25 mm and the weight is 2.4 grams. 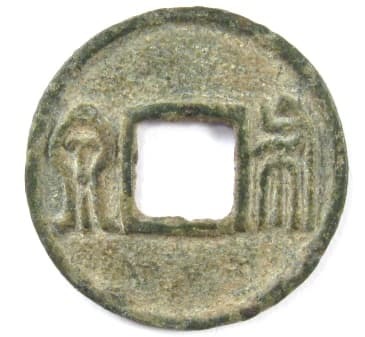 This is the reverse side of a coin from the Tang Dynasty (618 - 907 AD). It was cast in 759 AD during the reign of Emperor Su Zong. To the right of the square hole is what is called an "auspicious cloud". Below the square hole is what is know as a "moon". Again, this was a normally circulated coin that has charm features. This is the obverse side of the coin. The inscription is qian yuan zhong bao (乾元重宝) read top to bottom and right to left. The coin is 24 mm in diameter and weighs 3.6 grams. 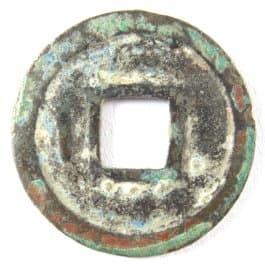 This coin is also from the Tang Dynasty. It was cast beginning in the year 621 AD during the reign of Emperor Gao Zu. The inscription reads kai yuan tong bao (开 元通宝). 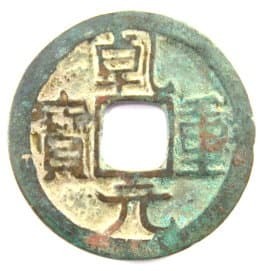 The notable feature of this particular coin has to do with the character yuan (元) which is located below the square hole. 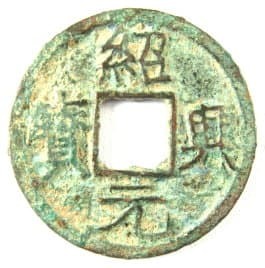 If you compare it to the same character yuan (元) on the coin just above, you will see that on this coin there has been a "star" added on the right side of the character. Stars are found less often on the obverse of coins than on the reverse. This coin is 24 mm in diameter and weighs 3.5 grams. This is another kai yuan tong bao (开元通宝) coin from my collection. It has a normal (no star or other special feature) obverse side but has a "moon" below the central hole on the reverse side. The coin has a diameter of 25 mm and a weight of 3.2 grams. This is yet another kai yuan tong bao (开元通宝). The obverse side has no special characteristics but the reverse side has a moon above the hole and a star below the hole. This coin is 24 mm in diameter and weighs 3.9 grams. To the left is a final example of a Tang Dynasty coin with a charm-like feature. 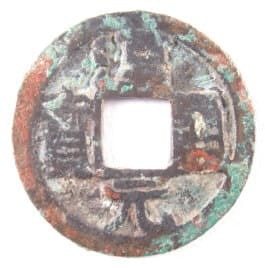 This is the obverse side of a fairly large coin cast during the reign of Shi Siming (758-761 AD). The inscription is shun tian yuan bao (顺天元宝). As you can clearly seen, the reverse side of the coin has a moon above the square hole. The coin is 37 mm in diameter and has a weight of 19.8 grams. The Later Han was one of the Five Dynasties and Ten Kingdoms that existed 907 - 979 AD. 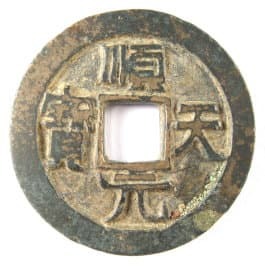 This is the obverse side of a coin cast in 948 AD by Emperor Yin of the Later Han Dynasty (948-951 AD). The inscription is han yuan tong bao (汉元通宝) which translates as "Han First currency". If you look closely at the reverse side of the coin you will see a crescent moon to the left of the square hole. This coin has a diameter of 24 mm and weighs 3.1 grams. The Southern Tang Kingdom existed during the years 937-975 AD. 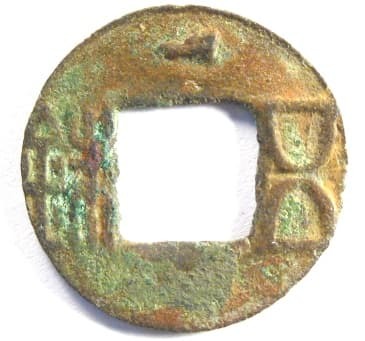 The coin shown here has the inscription da tang tong bao (大唐通 宝) and was cast beginning in 959 AD during the reign of Li Jing. The reverse side of the coin has a large crescent moon above the square hole. The coin has a diameter of 21 mm and a weight of 2 grams. 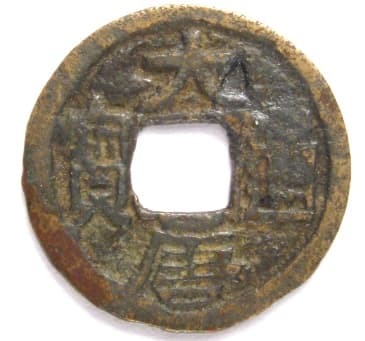 The obverse side of the coin at the left has the same inscription as the Tang Dynasty kai yuan tong bao (开 元通宝) seen above. However, this coin is made of lead and was actually cast during the Ten Kingdoms (907-960 AD). It is believed to have been cast during the Southern Han period in the area of Canton (Guangzhou), in Southern China, which was then known as Xingwangfu. The reverse side has the Chinese character for "south" (nan 南) above the square hole. The character for "one" (yi 一) is below the hole. This coin is unusual in that it has two additional symbols. To the left of the hole is a crescent (moon) with a dot (star). To the right of the hole is a "lucky" or "auspicious" cloud. This lead coin has a diameter of 20 mm and a weight of 2.3 grams. 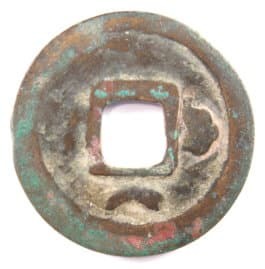 This is the obverse side of a large "10 Cash" coin from the Northern Song Dynasty. The inscription (legend), which is read top to bottom and right to left, is chong ning zhong bao (崇宁重宝). Chong (崇) has the meaning of "sublime" and "worship". Ning (宁) can translate as "tranquil" and "peaceful". It was cast in the years 1102 - 1106 during the reign of Emperor Hui Zong (1101 - 1125). What is most interesting about this coin is the hand engraved picture on the reverse side. Someone, during the past 900 years, took this coin with its inscription conveying the sense of "sublime", "worship" and "tranquil", and engraved a picture on the back. In so doing, they converted a circulating coin into a charm. To the left of the square hole is what appears to be a mother embracing a small child. To the right of the square hole is exactly the same hand engraved picture but upside down. While we can only speculate on the meaning, this particular scene was certainly considered precious to the unknown artist who did the engraving so long ago. This coin has a diameter of 34.5 mm and a weight of 10.6 grams. 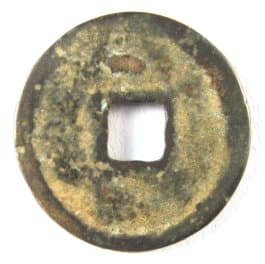 This is the obverse of a Southern Song Dynasty (1127 -1279 AD) coin. The inscription is read clockwise beginning at the top as shao xing yuan bao (绍兴元 宝). It was cast in the years 1131-1162 AD during the reign of Emperor Gao Zong. You will note that the reverse has a moon above and a star below the square hole. The coin has a diameter of 29 mm and weighs 5.6 grams. The Jin Dynasty was established by the Nuzhen (Jurched) (女贞) nationality in northern China during the late Northern Song Dynasty. At first, the new dynasty relied on coinage from the Liao and Song Dynasties. Beginning in the year 1157, however, they began to cast their own coins. Modeled after the da guan tong bao (大 观通宝) coins with the personal calligraphy of Northern Song Dynasty Emperor Hui Zong, the Jin coins display a high degree of workmanship with beautiful calligraphy. The nicely made coin at the left was cast in the year 1189 AD during the reign of Emperor Shi Zong of the Jin Dynasty. The inscription reads da ding tong bao (大定通宝). The Chinese character above the square hole on the reverse side is you (酉) which is the tenth of the Twelve Earthly Branches. The traditional Chinese calendar system, purportedly originating in the year 2697 BC by the legendary Yellow Emperor (Huangdi), identifies dates by pairing one of the ten Heavenly Stems with one of the twelve Earthly Branches. The cycle repeats every sixty years. 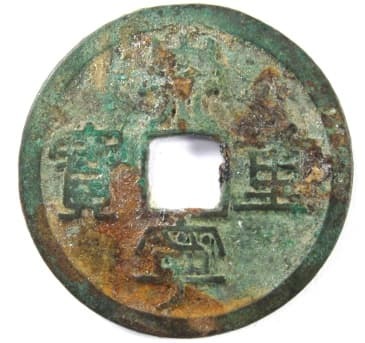 This coin can be dated to 1189 AD because Emperor Shi Zong ruled during a 60 year period of the Heavenly Stem ji (己). 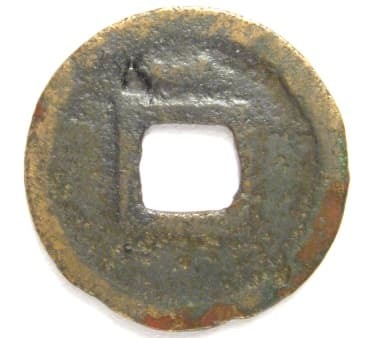 Paired with the you (酉) on the coin establishes the date as 1189 AD. The distinguishing feature of this coin, however, is the prominent dot or "star" located at the 10 o'clock position. The coin has a diameter of 25 mm and a weight of 4.3 grams. This coin was cast in the years 1368-1398 AD during the reign of Emperor Tai Zu of the Ming Dynasty. The inscription (legend) is hong wu tong bao (洪武通宝). 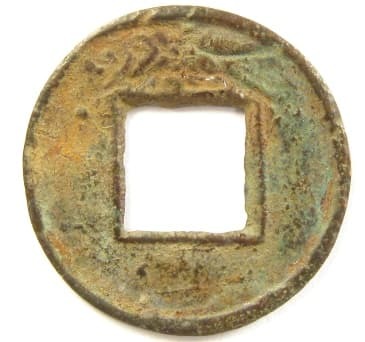 Please note that this coin has a star to the right of the character wu (武) below the square hole. This particular coin also has a moon on its reverse side above the square hole. The coin has a diameter of 23 mm and weighs 4.2 grams. This Chinese coin was only cast in the years 1727-1729 during the reign of Emperor Shi Zong (1723-1735) of the Qing Dynasty. The inscription is yong zheng tong bao (雍正通宝). 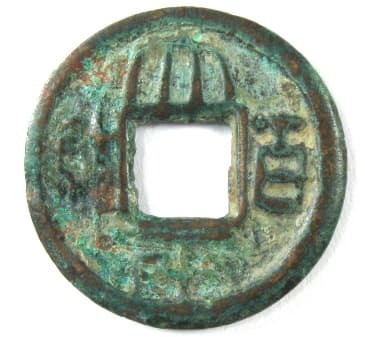 The reverse side has the two Manchu characters "boo gung" indicating that the coin was cast at the mint in Lanzhou, Gansu Province. These yong zheng tong bao (雍正通宝) cash coins cast in Gansu Province quickly became popular as an amulet capable of preventing mutilation from evil spirits. This is because the Manchu character "gung" (gong), at the right of the square hole, resembles the broadsword used by Emperor Guan (guan di 关帝). Emperor Guan, also known as Emperor Kuan, was a popular general of the Kingdom of Shu (221-265 AD). He became famous for his use of the broadsword. He was so revered by later dynasties that he was proclaimed the God of War and many temples and shrines were built in his honor. Nowadays, he is also worshipped as the "God of Commerce" by Chinese businessmen particularly in Hong Kong. This coin is 26.2 mm in diameter and weighs 4.4 grams. 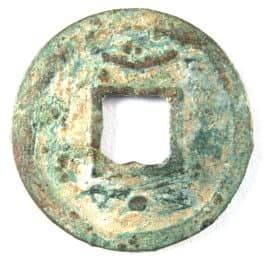 This is the obverse side of a Qing (Ch'ing) Dynasty coin which was cast in the years 1796-1820 AD during the reign of Emperor Ren Zong. The inscription is jia qing tong bao (嘉庆通宝). This is the reverse side of the above coin showing a star below the square hole. 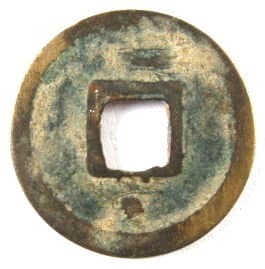 The Manchu character to the right of the square hole indicates that the coin was cast at the Board of Works mint. The coin measures 25 mm in diameter and weighs 3.6 grams. This is the reverse side of another jia qing tong bao (嘉 庆通宝) coin in my collection. 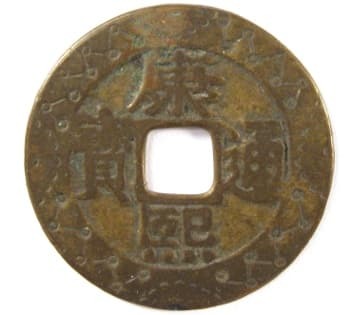 In this example, a star is above the square hole, and the Manchu character on the right means that this cash coin was cast at the Board of Revenue mint. The coin measures 24 mm in diameter and weighs 4.3 grams. 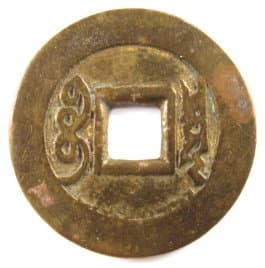 This is an example of an official Qing (Ch'ing) Dynasty minted coin, meant for general circulation, but which was immediately considered to have the powers of a charm. 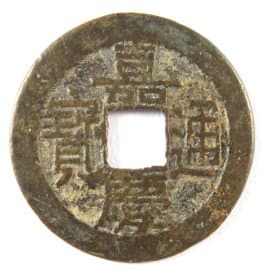 In the year 1713 AD, to celebrate the 60th birthday of Emperor Sheng Zu (Kang Xi), this special issue kang xi tong bao (康熙通宝) coin was cast with a bronze of a golden color. A 60th birthday is considered a major event in China. In honor of this milestone, the Chinese character xi (熙), which is located below the square hole, was written slightly differently. The character would normally have a vertical line at its left. Also, the part of the character normally written as (臣) has the center written as a (口) instead. Finally, the upper left part of the tong (通) character, located to the right of the square hole, has only one dot instead of the usual two. There are several stories connected with this coin that have been passed down for the last 300 years which have given this coin the power of a charm. The stories have turned out to be historically false but continue to be believed. The different versions of the story basically state that the bronze used in the casting of this coin came from the melting down of gold statues of the eighteen disciples of the Buddha. These disciples were called lohan (luohan 罗汉) in Chinese. Because the metal used to cast the coins was believed to be directly associated with these disciples of Buddha, the coin is believed to have special powers and is usually referred to as the lohan coin or arhat money. Because of its special charm qualities, these coins were given to children in olden times as lunar New Year money (yasuiqian 压岁钱). 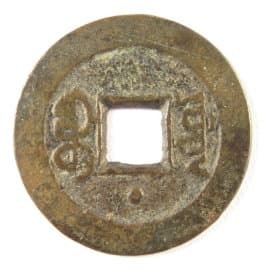 These coins were also considered to represent good luck because they commemorated a reign lasting for sixty years which is a complete cycle of the traditional Chinese calendar and thus symbolic of a long life. Up until about the 1940's, there was a tradition in the rural villages of Shanxi Province where stylish young men liked to carry a lohan coin between their teeth. This was an attempt to mimic the tradition of stylish young men in the cities who liked to show off a gold tooth. If you examine this particular coin carefully, you will notice what seem to be gold specks on the surface. My guess is that sometime in the (distant?) past someone put gold leaf on the coin. Then, again, maybe the stories are true and the coin does contain real gold! This is the reverse side of the coin. 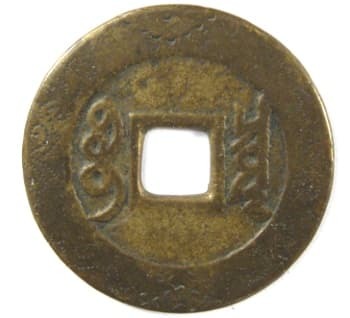 Since the Qing (Ch'ing) Dynasty was ruled by the Manchu, the characters on the reverse are in the Manchu script and not Chinese. 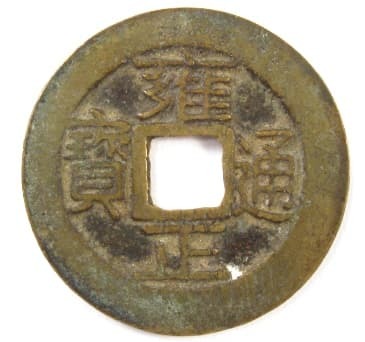 The script indicates that this coin was cast by the Board of Revenue in Peking. The coin is slightly larger than 26 mm and weighs 4.8 grams. Other coins cast during the reign of Emperor Kangxi are also considered to have charm and amulet properties. Please see Chinese Poem Coins. 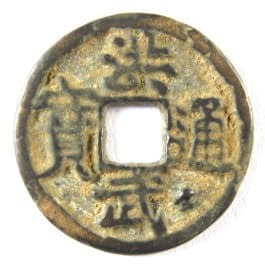 Pictured below is another example of the special kang xi tong bao (康 熙通宝) coin cast to commemorate the 60th birthday of Emperor Sheng Zu (Kang Xi) in 1713. As discussed above, this coin was considered to have charm characteristics. Moreover, the Chinese characters kang xi (康熙) can be translated as "health and prosperity" which makes the coin even more auspicious. For these various reasons, these special kang xi coins were frequently selected to be charms which could be further enhanced with hand engravings. This coin is an example of a coin with hand engraved rims. I have enlarged the image to make viewing more convenient. The upper right, upper left, lower right and lower left sections of the rim all have a series of dots connected by zigzag lines. If you examine the rim closely, however, you will discover that the number of "dots" differs. The lower right and lower left sections of the rim have a series of seven dots each. The dots actually represent stars. The series of seven stars connected together by a zigzag line represents the Big Dipper (beidou 北斗) constellation. From the beginning in the Shang Dynasty, the Chinese considered the Big Dipper to be a deity. In Daoism (Taoism) the Big Dipper was believed to be where the celestial gods dwelled. However, the rim engraving on the upper left portion of the rim has "nine stars" connected by a zigzag line. This can be explained by the fact that the ancient Chinese believed that the constellation actually consisted of seven visible stars along with two invisible "attendant" or "companion" stars. 1) Han Zhongli (汉钟离) was a Han Dynasty general who carries a feather fan used to revive the dead. 2) Lu Dongbin (吕洞宾), known for his drinking and fighting, carries a demon-slaying sword and a fly whisk which he uses to walk on clouds or fly to the heavens. 3) Zhang Guolao (张果老), who rides a donkey, sometimes seated backwards, carries a tube-shaped bamboo musical instrument called a yugu (鱼鼓). 4) Li Tieguai (李 铁拐), also known as "Li with the iron crutch", carries a gourd filled with magic elixir. 5) He Xiangu (何仙姑), the only female in the group, carries a lotus or peach, or a fly whisk. 6) Han Xiangzi (韩湘子), who carries a flute, can predict the future and also make fruits and flowers grow out of season. 7) Cao Guojiu (曹国舅) carries a ruyi sceptre or castanets. 8) Lan Caihe (蓝采和), depicted as either a male or female, usually holds a fruit/flower basket, a bowl or a flute. Located between each of these four groupings of star constellations is a design consisting of a semicircle with a dot in the middle. This symbolizes the "sun" and also the Emperor's "light" and wisdom. The representation of the sun rising from the edge of the rim can also symbolize hope for being successful in the imperial examination system and thus becoming a government official together with the honor and wealth which accompanied such a position. The reverse side of the coin has a more limited number of engravings. At the top and bottom are the same semicircular "sun" symbols as on the obverse side. The other areas (most clearly seen on the left part of the rim) have a meandering wave-like design. Unfortunately, the engravings suffer from wear which further indicates that they were made sometime in the distant past. This coin has a diameter of 27 mm and a weight of 4.2 grams. 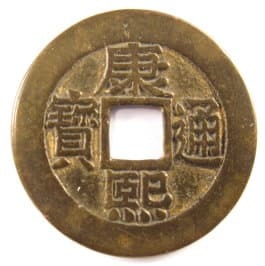 If you have an interest in the close relationship of Chinese coins and charms, please visit Chinese Charms with Coin Inscriptions.